The NFL Draft is here. As Grant Park turns into Draft Town, the NFL will host a slew of events for fans, from autograph signings to football clinics to free concerts. Here's a look at a schedule of some of the bigger events and activities for fans. The Draft runs from April 30 to May 2, but the events begin a day early. For other highlights of Draft Town, see our list of the top 10 things to know about the NFL Draft. 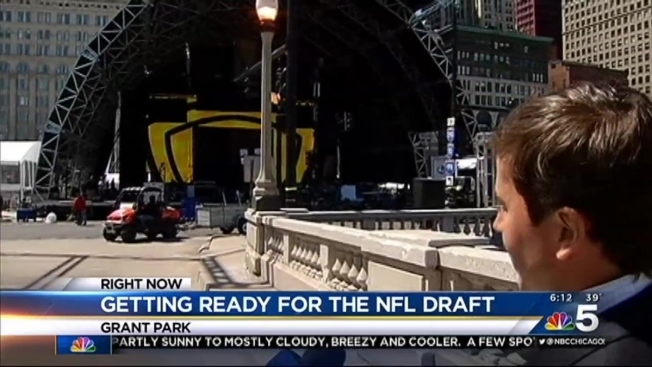 The organization will host numerous events in Grant Park, which will be transformed into Draft Town. NBC Chicago's Christian Farr reports. Introduction -- 12 p.m. to 1 p.m. NFL legends welcome 2015 Draft prospects to the NFL family and discuss their careers on and off the field. Located at Pioneer Court. NFL Draft Kickoff -- 4 p.m. to 11:30 p.m. The Draft officially kicks off on the Gold Carpet with coverage from the NFL Network. On-Field Clinics for Kids -- Every half hour from 4 p.m. to 7:30 p.m. Boys and girls between 6 and 14 years old can participate in football and flag football clinics with coaches and NFL players. Sign-up is open on a first-come, first-served basis. Parents can sign their children up here. NFL Autographs -- Get free autographs from NFL legends and current players at the Autograph Stage. Signings will take place in shifts from 4 p.m. to 6 p.m. (Jon Stinchcomb, Brig Owens, Merril Hoge), 6 p.m. to 8 p.m. (Kenny Easley, Robbie Gould, Mel Blount), 7 p.m. to 8 p.m. (Keith Van Horne, Shaun Gayle) and 8 p.m. to 9:30 p.m. (Charles Haley, Richard Dent). Gold Carpet for Draft Prospects -- 5 p.m. to 6:30 p.m. The 2015 NFL Draft prospects line the Gold Carpet in Michigan Avenue. Chicago Bears Drumline -- 5 p.m. to 9 p.m. 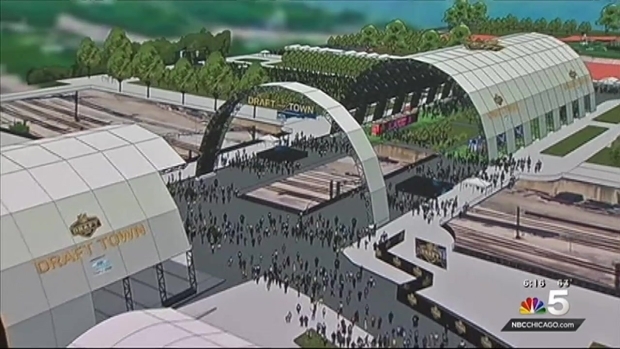 The performance will take place on the music stage in Draft Town. Indianapolis Colts Cheerleading -- 5 p.m. to 9 p.m. The performance will take place on the music stage in Draft Town. Staley Da Bear Appearance -- 6:30 p.m. to 7:30 p.m. The Chicago Bears mascot meets and greets fans at the Bears Team House in Draft Town. King College Prep Jazz Band -- 7 p.m. to 8 p.m. The high school jazz band performs on the music stage. NFL Autographs -- Get free autographs from NFL legends and current players at the Autograph Stage. Signings will take place in shifts from 4 p.m. to 6 p.m. (Richard Dent, Eddie Royal, Ahman Green), 6 p.m. to 8 p.m. (Tank Johnson, Herman Moore, Kyle Long), 7 p.m. to 8 p.m. (James "Big Cat" Williams, Adrian Peterson) and 8 p.m. to 9:30 p.m. (Anthony Adams). Family Football Clinic -- 9 a.m. to 11 a.m. The NFL and USA Football will host a football clinic for parents and their children. The children will participate in a youth football clinic while their parents listen to football-themed panel discussions. NFL Autographs -- Get free autographs from NFL legends and current players at the Autograph Stage. Signings will take place in shifts from 10 a.m. to 12 p.m. (Darren Woodson), 11 a.m. to 12:30 p.m. (Duane Starks), 12 p.m. to 1:30 p.m. (Thomas Davis, Darren Woodson, Jerry Azumah, Anthony Davis), 12 p.m. to 2 p.m. (Devin McCourty, Jason McCourty), 2 p.m. to 4 p.m. (Otis Wilson, Ryan Mundy) and 4 p.m. to 6 p.m. (Aeneas Williams, James "Big Cat" Williams). On-Field Clinics for Kids -- Every half hour from 11 a.m. to 1 p.m. Boys and girls between 6 and 14 years old can participate in football and flag football clinics with coaches and NFL players. Sign-up is open on a first-come, first-served basis. Parents can sign their children up here. Chicago Bears Drumline -- 2 p.m. to 4 p.m. The performance will take place on the music stage in Draft Town. Northwestern University Marching Band -- 2 p.m. to 4 p.m. The performance will take place on the music stage. Indianapolis Colts Cheerleading -- 12 p.m. to 5 p.m. The performance will take place on the music stage in Draft Town. NFL FLAG Festival -- All day. The first ever NFL flag football festival will take place on Hutchinson Fields in Grant Park. Teams can sign up here. Free Live Concert -- 5 p.m. to 7:45 p.m. JC Brooks and The Uptown Sound perform a free live concert in Draft Town. Marc Scibilia will open the show. Tickets are not required for the show, and the event is open to the public.